Has it been a while since you’ve been scuba diving? Do you feel like your scuba skills and knowledge are a bit rusty? The Scuba Review Tune-up is just the refresher you need. It reacquaints you with diving so that you’re back to feeling comfortable in the underwater world in less than a day. Brush up on your scuba knowledge and skills. Improve your diving ability, and get your scuba gear ready for your next scuba vacation or diving holiday. After you complete the knowledge assessment, you go through the Confined Water Skills Preview. Quickly and effectively review scuba diving fundamentals with PADI’s Scuba Tune-Up Guidebook or via E-Learning. 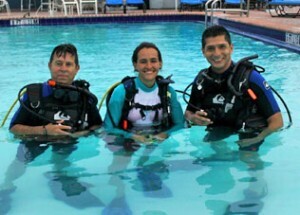 Begin by answering a few questions related to dive safety, problem management and dive planning. Then it is off to the pool to review your skills! After the Confined Water Skills Review you will then go on a two tank Open Water dive off of one of the Sea Experience boats. The entire Scuba Tune-Up / Scuba Review is completed in less than a day and is conducted by one of Sea Experience’s PADI Instructor’s.